Dunes et Soleil is a small yet wonderful family friendly campsite which benefits from direct access to a fantastic beach. Aptly named “Dunes and Sun”, the campsite is well sheltered by a wild sand dune with the beautiful Mediterranean sea located on the other side. Beyond the sand dune, the sea can be heard lapping gently against the shore making it an ideal holiday location for beach loving families. The beach itself is vast with golden sand stretching out for as far as the eye can see in either direction. This massive expanse of beach is perfect for swimming, relaxing in the sun, playing games and of course building sandcastles. Dunes et Soleil is a brilliant campsite for families, whether you’re looking for a quiet and peaceful holiday location or whether you’re looking to get a bit more out of your campsite. The nearby Marseillan-Plage is a bustling seaside resort which offers a vast array of different things to see and do. Restaurants, cafes, bars, shops and discos can be found within this brilliant resort offering a variety of evening entertainment and more importantly places to eat. 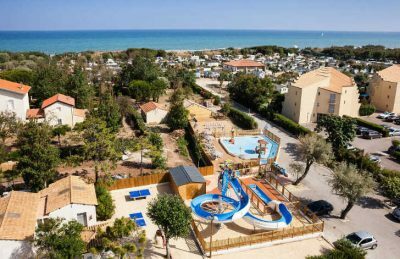 If you’re looking for a campsite with a stunning swimming pool complex then Dunes et Soleil won’t be for you. Due to it’s brilliant beachside location, swimming facilities at the campsite are limited. There’s a lovely paddling pool for toddlers and also a couple of water slide for all ages but no large family swimming pool on site. Dunes et Soleil is a smaller campsite and as such the on site activities and facilities are limited compared to larger campsites. On site activities at Dunes et Soleil include table tennis, gym, boules and a playground. Facilities available at Dunes et Soleil include WIFI, takeaway, bar, animation team, games room, washers and dryers. Accommodation at Dunes et Soleil campsite includes a range of tents that are available from Eurocamp.